The two presidents discussed the recent visits to the south by high-level North Korean officials, the South Korean presidential Blue House said in a statement. Seoul: South Korea plans to send a special envoy to North Korea in response to an invitation from leader Kim Jong Un, South Korean President Moon Jae-in told his U.S. counterpart Donald Trump in a phone call on Thursday. The Olympics gave a boost to recent engagement between the two Koreas after more than a year of sharply rising tensions over the North's missile programme and its sixth and largest nuclear test in defiance of U.N. sanctions. 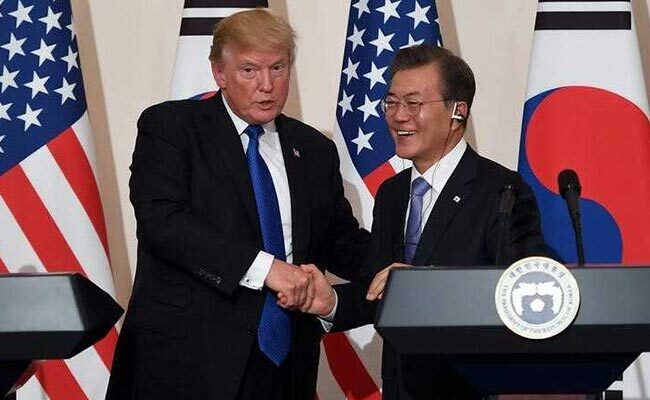 "(Moon and Trump) agreed to continue to make efforts to head toward the Korean peninsula's denuclearisation by maintaining the momentum of South-North dialogue," the Blue House statement said. "President Trump and President Moon noted their firm position that any dialogue with North Korea must be conducted with the explicit and unwavering goal of complete, verifiable, and irreversible denuclearisation," the White House said. In sending an envoy to Pyongyang, Moon said he would be seeking to reciprocate for the senior delegations dispatched to the Olympics by Kim Jong Un, including his sister, Kim Yo Jong, the first visit by a member of the North's ruling bloodline since the 1950-53 Korean War. Senior officials from Pyongyang visiting South Korea for the Winter Olympics said on Sunday their government was open to talks with the United States, while the White House said any talks with North Korea must lead to an end to its nuclear programme. Moon has urged North Korea and the United States to talk to resolve the issue of Pyongyang's weapons programme, which Kim has said he will never abandon. In the latest attempt to defuse the crisis over North Korea's weapons programme, Seoul urged Washington and Pyongyang to give ground to allow for talks.